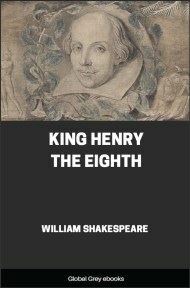 Henry VIII is a history play generally believed to be a collaboration between William Shakespeare and John Fletcher, based on the life of Henry VIII of England. As usual in his history plays, Shakespeare relied primarily on Raphael Holinshed's Chronicles to achieve his dramatic ends and to accommodate official sensitivities over the materials involved. Shakespeare not only telescoped events that occurred over a span of two decades, but jumbled their actual order. The play implies, without stating it directly, that the treason charges against the Duke of Buckingham were false and trumped up; and it maintains a comparable ambiguity about other sensitive issues. The disgrace and beheading of Anne Boleyn (here spelled Bullen) is carefully avoided, and no indication of the succeeding four wives of Henry VIII can be found in the play. However, Catherine of Aragon's plea to Henry before the Legatine Court seems to have been taken straight from historical record.